Today I’m hopping back to 1980 and across to Tokyo for ‘Firecracker’ by Yellow Magic Orchestra. YMO always existed slightly on the fringe of early 80s electronic music, perhaps as victims of geography. Their main claims to fame are ‘Behind The Mask’ which was covered by Eric Clapton of all people, and being the first project of Ryuici Sakamoto, acclaimed film score musician for such films as ‘The Last Emperor’ and ‘Merry Christmas Mr Lawrence’ (check out the sublime ‘Forbidden Colours’ with David Silvian from that soundtrack). They were so much more than just the Japanese Kraftwerk and you can see a clear lineage to Random Access Memories, particularly the opening track. Even the stage layout in this Budokan performance is very Daft Punk. Firecracker was re-released in the UK as ‘Theme from Invaders’ to attempt to exploit the new craze called ‘video games’ and got to number 17…. Y.M.O. – another wonderful choice, I listened to their “solid State Survivor” album a couple of times at the back end of last year, and loved every minute. 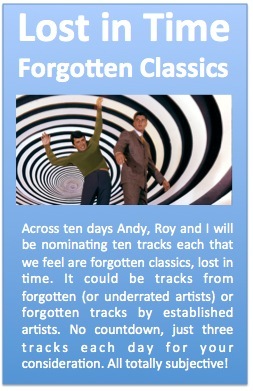 Right, for my Day 3 choice, I’m sticking with the ’80s, and I’m tackling the remit of “forgotten tracks by established bands”. For those of you who don’t know me, there’s no band I probably know more about than XTC. Most people have heard “Making Plans for Nigel” and “Sgt. Rock is going to help me”, but I’m going to choose a song of theirs which has kept cropping up recently. Lead singer Andy Partridge wrote it about a woman who came into his life at this time and would eventually become his second wife. YMO are genuinely one of the very few bands/artists I have no opinion on whatsoever ! Again not heard it before and again enjoyed it. I really must do some serious investigation of XTC at some point. All I have is a hits compilation on which this sadly does not feature. A very similar use of appropriate 60s film footage to the Prefab Sprout ‘Jewel Thief’ video that featured in our 2013 highlights. Both work brilliantly. Never heard this track before – definitely more in their psychedelia vein than their earlier, more angular New Wave stuff (which I prefer) – still its XTC, so its quality. My wife and eldest daughter can’t watch ‘The Birds’ as it scares the beejesus out of them. My day 3 choice is ‘Young Savage’ by Ultravox! Released in 1977 from their second album of that year ‘Ha, Ha, Ha’ it didn’t chart and got lost in the general maelstrom of the punk uprising, but the influence of this track (and the following year’s ‘System of Romance’ album) can still be heard today in any ‘Alternative Rock’ act who start messing around with synths.